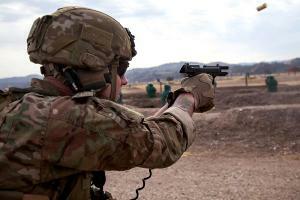 Army weapons officials maintain that combat troops need a more effective pistol and ammunition. But experts from the law-enforcement and competitive shooting worlds argue that tactical pistol ammunition — no matter the caliber — is incapable of stopping a determined adversary without multiple shots in most cases. “Most of the guns in .40 caliber on the market right now were actually designed to be 9mm originally and then turned into .40 calibers later,” Langdon told Military.com. Langdon served 12 years in the Marine Corps where he was the chief instructor of the Second Marine Division Scout Sniper School and the High Risk Personnel Course. He’s been a competitive pistol shooter for 15 years where he has won competitions in the International Defensive Pistol Association and two World Speed Shooting titles. As part of the joint requirement process for MHS, Army weapons officials did a “very thorough cost-benefit analysis” that showed supported the effort, Easlick said. “We have got an old fleet of M9s right now; it’s costing us more to replace and repair M9s than it would cost to go get a new handgun,” he said. “We have submitted numerous changes or product improvements that really address a lot of the shortcomings that are either perceived or real,” said Gabe Bailey, Business development manager for Beretta’s military division.